Lovely 1 Bedroom with kingsize or 2 single beds with air conditioning, lounge with single bed and sleeper couch, open plan kitchenette, shower, basin and toilet. 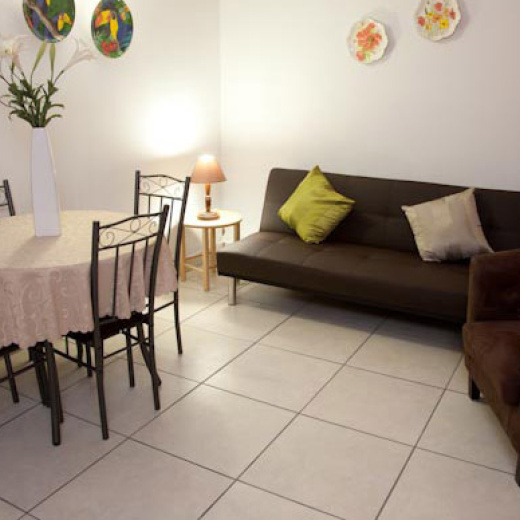 The apartment comes with DSTV - B'nB Bouquet, secure off road parking and can sleep 4 persons. We are very conveniently situated midway between Durban and Umhlanga Rocks, a quick easy 10 minute drive from all the popular swimming beaches. Closeby are uShaka Marine World, Gateway Theatre of Shopping and Entertainment Centre, La Lucia Mall, both Suncoast and Sibaya Casinos, The International Convention Centre (ICC) and all the main International Sporting stadia. Within +/- 1 km there are several popular family restaurants, pubs, coffee shops, supermarkets, shops and banks. We have safe, secure off road parking right out side your unit. PLEASE BE AWARE that we are one kilometre from the ocean but not within comfortable walking distance of swimming beaches. Conveniently situated midway between Durban and Umhlanga Rocks, a quick, easy 10 minute drive to all the popular swimming beaches. Nearby is Gateway Theatre of Shopping and Entertainment Centre, La Lucia Mall, uShaka Marine World, ICC International Convention Center, both Suncoast and Sibaya Casinos and all International Sporting Stadia. Cosy Corner, new 2 bedroom apart!